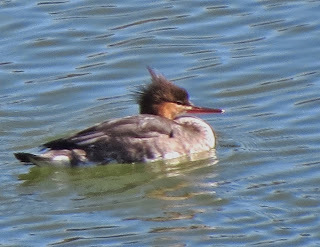 Yesterday I found 16 Red-breasted Mergansers at Brush Hollow Reservoir which is about 15 miles from where I live. Compared to many reservoirs in southern Colorado this is a fairly small body of water; however there are very few lakes or ponds in my county and it is the largest of them. We don't get Red-breasted Mergansers often in my area and this is an unusually large number for us. In addition to these mergansers there were a number of other common waterfowl including a nice raft of about 20 Redheaded Ducks. I also had a small flock of Bushtits work their way past me in the junipers on the hill above the reservoir where I was parked. 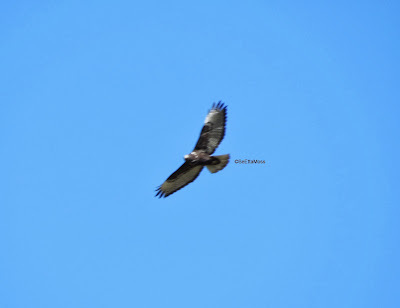 After I gave up looking for it I was driving back home when I ran into the same hawk again as it soared in large circles so I was able to get the photo at the top. 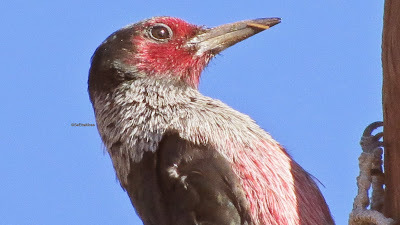 I followed it in my car and it came down to perch for a short time so I got the bottom two pics.